In 2006, far more Americans said there was solid evidence that the average temperature has been rising over the past few decades. 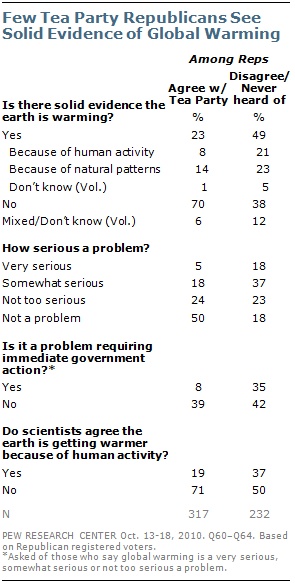 In July of that year, 79% believed there was evidence of global warming, and half (50%) said it was mostly caused by human activity. Much of the change in attitudes about global warming occurred between April 2008 and last fall, with the decline coming mostly, though not entirely, among Republicans and independents. The new survey finds continuing support for a range of policies to address the nation’s energy supply, including requiring improved vehicle fuel efficiency and increasing federal funding for research on wind, solar and hydrogen technology. Support for allowing more offshore oil and gas drilling — which declined during the Gulf of Mexico oil leak — has rebounded modestly. 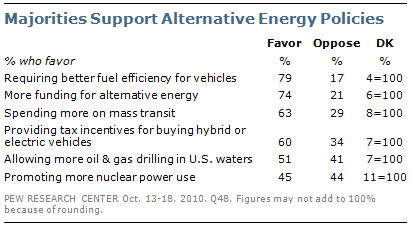 Currently, 51% favor allowing more offshore oil and gas drilling, up from 44% in June. 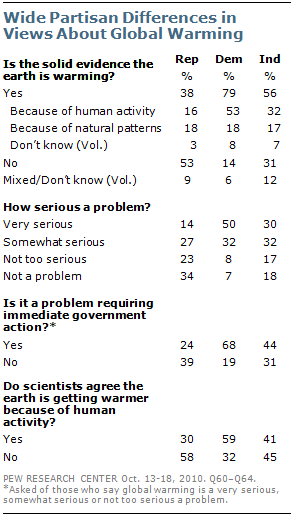 Among Republican registered voters who agree with the Tea Party, fully 70% do not think there is solid evidence that the average temperature on earth is warming. By comparison, only 38% of Republican voters who disagree with the Tea Party or who have never heard of the movement express this view. 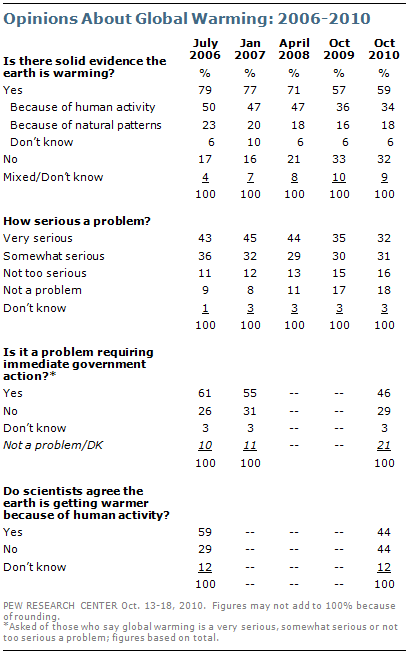 Half (50%) of Tea Party Republican voters also say global warming is not a problem at all; 24% say it is not too serious, and just 8% think it is a problem that requires immediate government action. There continues to be a wide partisan gap in views about drilling in U.S. waters, and the gap has grown larger since February of this year. About three-quarters (74%) of Republicans favor expanded offshore oil and gas drilling, identical to the proportion who expressed support early this year. 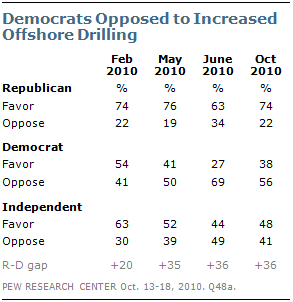 By contrast, only 38% of Democrats now favor expanding offshore drilling, down from 54% in February. 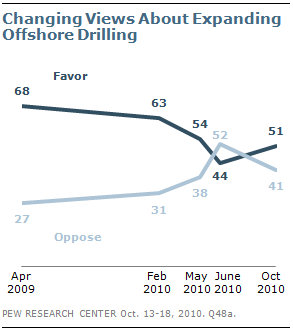 Currently, a majority of Democrats (56%) oppose expanding offshore drilling. 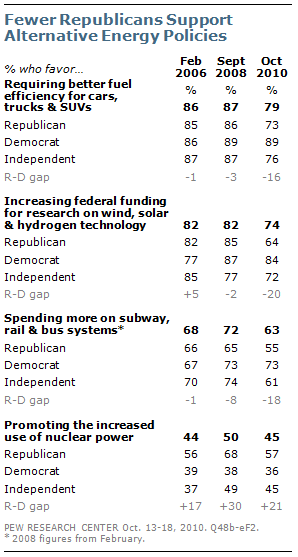 Majorities also favor spending more on subway, rail and bus systems (63%) and providing tax incentives for buying hybrid or electric cars, trucks and SUVs (60%). By contrast, the public continues to be divided about promoting the increased use of nuclear power (45% favor, 44% oppose).